Audiophiles delight! Bookmans Speedway has a collection of vinyl unlike any we have had before. We have a collection of original master recordings from Mobile Fidelity Records. These are reissues of the master press recordings. For those of us not already in the know, the master press is the first recording of an album and the one that the rest of the copies are from. These are also known as “lacquers” and this collection has been cleaned and remastered for better, more pure sound. These master recordings reissues are perfect for collectors. Not only can they be hard to find, with limited amounts being pressed, but they can be pricey. Bookmans Speedway is your source for these beauties and they are only $40 each. All Bookmans merchandise can be purchased with trade credit and so can these. This collection is perfect for the serious collector and connoisseur because the restored high definition presses have more supplements. The range of styles and genres is extensive. 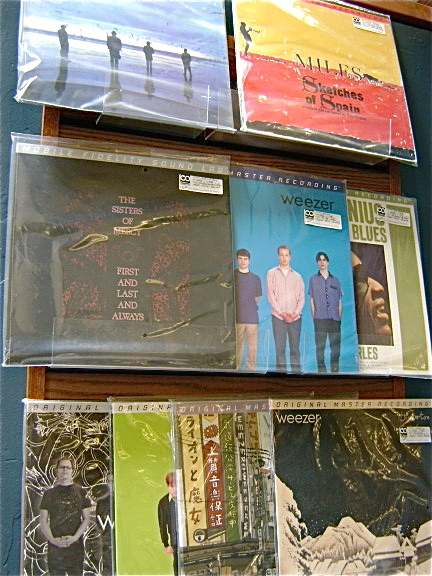 Our current selection includes Miles Davis’ Sketches of Spain arranged and conducted by Gil Evans, Sisters of Mercy’s First and Last and Always, Echo and the Bunnymen’s Heaven up Here, Ray Charles’ The Genius Sings the Blues, and several by Weezer including The Big Album, The Green Album, Pinkerton, Make Believe, and The Lion and the Witch. Stop by Bookmans Speedway to check out this one-of-a-kind collection, high-def remasters that are crystal clear with pin-drop sound perfection. Complete your collection or start one. These babies are hot, heavenly and high fi. * Bookmans can not guarantee stock. If you are interested in a specific title mentioned in this article, give Bookmans Speedway a ring at 520.748.9555. Bookmans is the place to browse, but it’s a good idea to make sure the title is still on our shelves before you come in.